There is nothing eye catching as enjoying a high definition DVD on Apple TV with family and friends in the comfort of your home. The numerous features that come with Apple TV are enough attraction for individuals to play DVD on Apple TV. Apple TV offers its users with full HD 1080p output as well as AirPlay functionality. Talk about the latest technologies Apple TV does not disappoint in this area, it comes with iCloud backup of the TV, and iTunes Match, Photo Stream, among other evident technologies. However, it is well known that Apple TV supports very few file formats, which include H.264 and MPEG-4 videos meaning DVD cannot work with your Apple TV supported formats. This means people will always get a very new TV experience by playing DVD on their Apple TV. Nevertheless, if you want to become one of those who are enjoying these incredible new TV experiences, then you will have to convert your video to an Apple TV supported file. For this purpose, you will have to find a good DVD ripper or a converter. 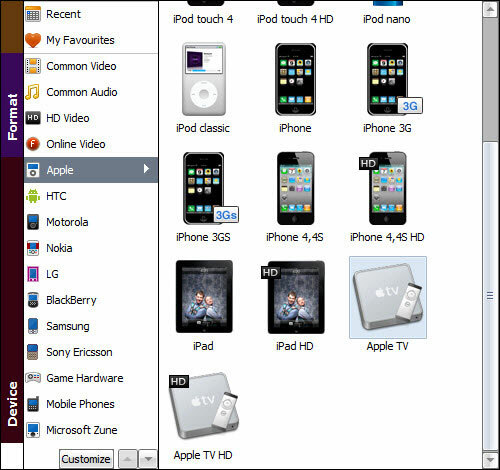 To complete the conversion, you need a DVD converter tool. Here Aimersoft DVD Ripper is recommended to help you rip DVD to Apple TV compatible video formats with easy operation and high output quality. Furthermore, you can even extract audio files from DVD for playing on Apple TV. The Windows version is compatible with Windows 8/7/XP/Vista while the Mac version supports Mac OS X 10.6, 10.7 and 10.8 Mountain Lion. Download it right now and start enjoying your DVD movies with full HD quality on Apple TV! 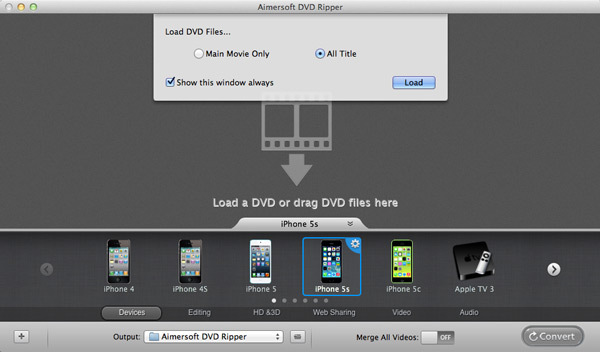 The Mac equivalence to convert DVD to play on Apple TV is Aimersoft DVD Ripper for Mac. It provides a straightforward way to rip, convert in addition to enjoying a vast DVD collection of movies on Mac. Here is a step by step guide on how to convert DVD to Apple TV on Windows-based computer and Mac. After downloading, install the program by double clicking it and following the installation instructions. Here the detailed steps to use DVD Ripper for Windows are described. The way to convert DVD video to Apple TV on Mac is the same. First, load the DVD movies you want to play on Apple TV into the program: click Load DVD or File > Load DVD folder to choose your DVD-ROM in the pop-up window and click the OK button to import the files. As you see, you can either convert the whole DVD or just choose the chapters you want to convert. 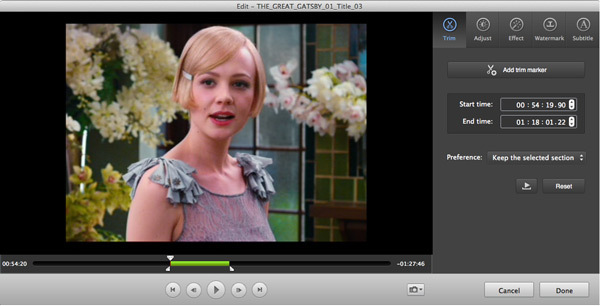 Tips: You can preview the added media files and take snapshots of your favorite movie scenes. Meanwhile, a built-in video editor is provided: simply click Edit or Trim to crop, rotate, cut videos, etc. to get the exact part you want and add some special effects to your videos. Since regular DVD movies usually have several subtitles like English, French, German, etc. You can click Subtitle to choose the one you need or select No Subtitle. For the audio tracks, simply click Audio Track and select the one you want. After that, click Profile and choose Apple TV as the output file format from the drop-download format list for your Apple TV. Currently the video presets for Apple TV and Apple TV HD are provided. If you want to play DVD on Apple TV 3, you can choose Apple TV HD as the output format, which is perfect for the New Apple TV. Finally, click the Start button to rip video from DVD for viewing on Apple TV. In a few minutes, you will get the converted movies. And then, just use iTunes to stream the files to Apple TV and enjoy them! Have a nice time! The procedures to convert DVD to Apple TV compatible format on Mac is also very simple. Install Aimersoft DVD to Apple TV Converter for Mac and launch it. Follow the simple steps below to begin converting DVD format. After the program is launched correctly, you need to import your DVD content by clicking the "+" button or "File > Load DVD Files" so that you can load your DVD to Aimersoft DVD Ripper for Mac. Tips: You can merge all DVD titles into one file by tick the option "Merge all vidoes". After loading the DVD that you want to convert, you can add additional files given that the software supports batch conversion of files. However, in this case you can decide to convert the chapters or the whole DVD. Select the file that you wish to convert after which you will choose Apple TV, which I suppose, is your output file format in this case. Lastly, click the Convert button to initiate the conversion process. 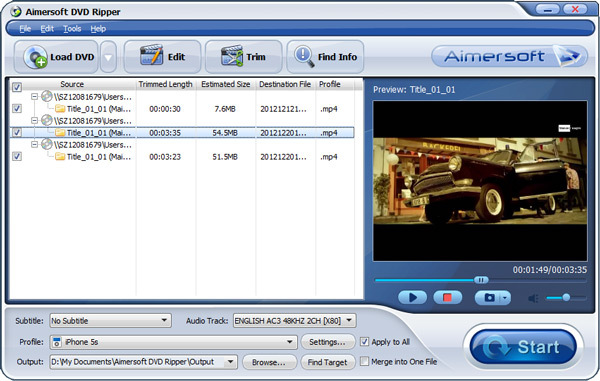 Before starting the conversion, you can edit the DVD movies as you like. What you can touch up to the videos is: trimming, cropping, volume, visual effects, watermarks, subtitles and more. 3,629,889 people have downloaded it. In order to view your converted file on apple TV you have to transfer the converted file to your Apple TV. Upon a successful completion of the conversion process, click Open Folder so as to access the converted video files. Launch iTunes and click files, then select add files to library option to add the converted clips to your iTunes library. After that, drag the converted file from iTunes library to Apple TV that is available in the device source list. After that, you will be able to watch your favorite DVD movie on Apple TV with a lot of ease. Therefore, you can enjoy your movie anytime you wish to. Tip 1. If you are new to Apple TV and DVD ripping world and you want to rip strictly copy protected DVDs on Apple TV, Aimersoft DVD Ripper for Mac will do the magic for you. It is advisable for Personal use only! Tip 2. The other easiest way to play DVD on your Apple TV you can use a third party media player, which are user friendly. Such third party media player includes Beamer, ATV flash among others.